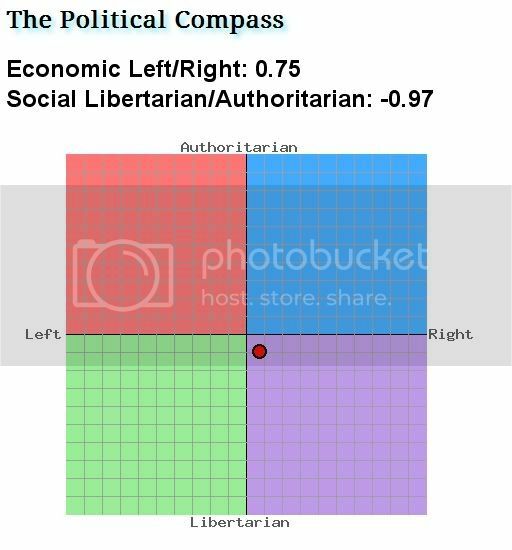 I seem to have become more right economically and more libertarian socially since the last time I took it, but I'm still dangerously close to the axis. It shows how far off liberals really are. libertarian right, no surprise there. Libertarian/Left is that an oxymoron? Socialist bias, ha ha!. I suspect they've just simplified it to make it easy for people, you're splitting hairs. Why, what was your outcome? No, he's correct. It definitely has a leftwing bias. I ran into the exact same problem he did. Right out of the gate on question #1 my immediate reaction was that I cannot answer this question in accordance with my beliefs. That presupposes medical care is a right in the first place. I do not believe that medical care is a right. So I am unable to answer the question. If I say "no" then I am restricting healthcare professionals from participating in the free market. If I say "yes" then I am saying that rich people deserve more rights than poor people. Either way I answer I am not being true to my beliefs. I got a +3.38 -1.9 which matches what I got on a similar test on the ontheissues.org site. The difference is, I was forced to answer questions dishonestly in order to get an accurate rating of my beliefs on this test, whereas on ontheissues I got the same rating by answering honestly. Interesting test but I feel some of the questions were worded a certain way in order to get a desired result. I didnt like that question as it was stated either. I think everyone should have basic medical care but if someone has a lot of money and they want to take more tests, etc than is required/suggested then there should be no problem. Technically that would be "agree/strongly agree" but that doesnt mean I think that poor people should have NO medical care whatsoever. Wouldnt quality of care mean a rich person can fly across the world to have an expensive procedure done? What's wrong with that?